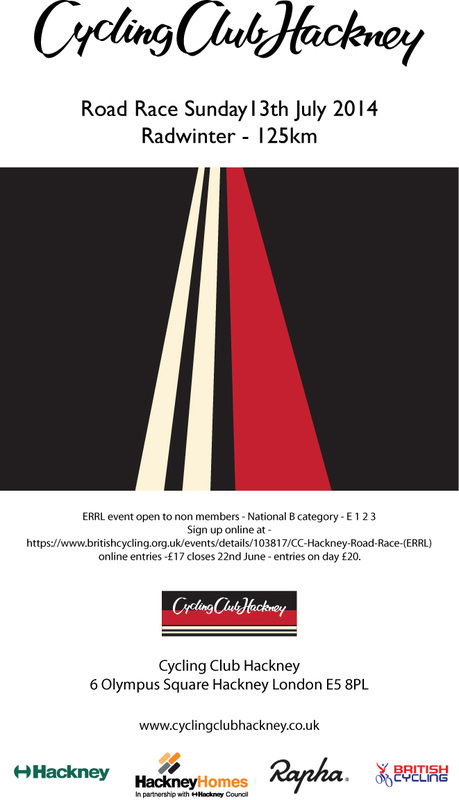 The 2014 CCHackney Road Race took place on Sunday the 13th of July on the Radwinter Course near Saffron Walden in tandem with the Essex Giro - one of the top womens racing events of the year - report below. Overnight night rain and downpours on the way up the M11 left me wondering if the race would go ahead - `I'd already had reports of flooding on the course. By the time we rolled into the Hq at the Lord Butler Fitness Centre in Saffron Walden it was beginning to clear meaning the races would go ahead after a slight delay. A set of temporary traffic lights had appeared on the hill leading to the finish so the line was moved back onto the circuit and once I had tracked down the BC finish line van we made it up the hill in time for the race to come through for the first time in 4 3/4 laps. Two riders had jumped away at the bottom of the hill - Richard Wood and Ben Sumner . Rhys Howells was leading the group behind and urging them on to catch the break. Next time round we had a break of five riders who had put some time in to the main bunch. The main bunch meanwhile was been thinned rapidly as rider after rider succumbed to punctures with the roads covered in debris washed off the fields and gravel drives beloved of country dwellers. One section of the race was being neutralised each lap as the road was close to a foot under water. The commissaires and marshals did an excellent job of ensuring this didn't become an issue, whilst the rain did its best to turn the rest of the course into a lake too. Next time round and the lead was out to over a couple of minutes with the lead group now down to four riders - Roy, Mike, Richard and Rhys. As the race came through for the last lap it looked like half the field had retired and the lead was up closer to three minutes. It looked like a straight fight between the leading four. We eagerly waited a close fought finish but CCH old boy Rhys Howells had other ideas he dropped the other three to come up the hill alone winning by 48 seconds form Richard Wood who placed second by a tyres width from Roy Chamberlain. Lubomir Belak led in the rest 3.35 down on the winner. Great racing by all the riders and great support from CCH members. Thanks to all those who helped out on the day and in advance and to the accredited marshals, motorbike marshals and commissaries for giving up their time. Thanks to all officials, accredited marshalls and members and friends of CCH and the ERRL for helping to stage this event. Sign on opens at 7.30am and closes at 8.15am when reserve places will be allocated. All riders must attend the pre-race briefing outside the HQ at 8.30am. 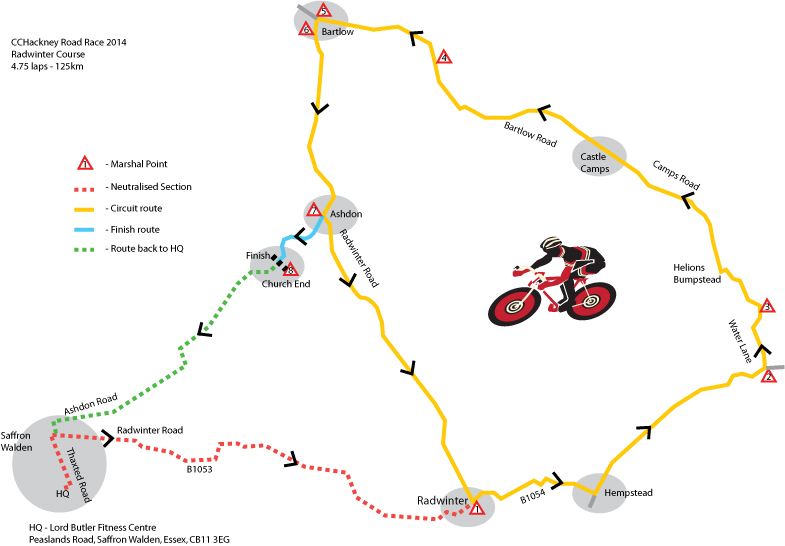 There will be neutral service – riders are expected to provide wheels or they may not be guaranteed service. The continued use of circuits in this area requires your co-operation and good behaviour towards local residents – stick wrappers back in your pockets please. No unofficial cars to follow race please and park away from finish area. No helmet, no licence = no ride. Online map of course here.